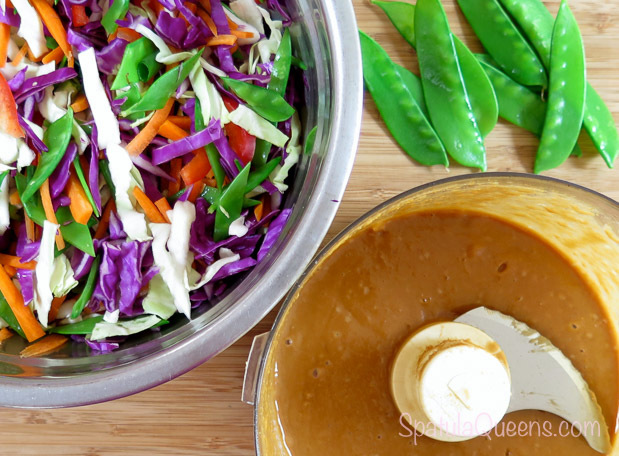 This sweet and tangy Asian Slaw recipe makes a fresh, crunchy, loaded-with-flavor slaw. 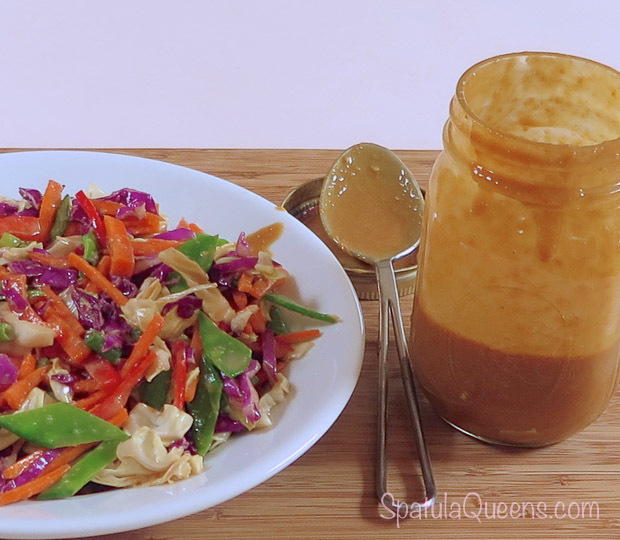 The dressing is very similar to a peanut sauce but the added vinegar thins it out and gives it a little zing. 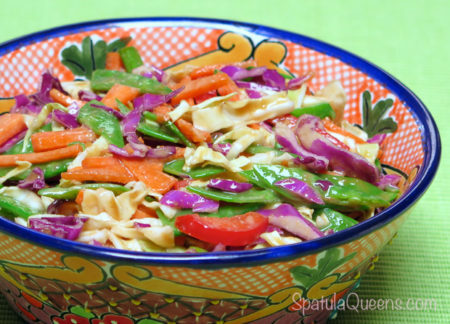 This Asian Slaw is always a winner at pot-luck gatherings. The dressing recipe makes just under a pint – enough to make two nice sized bowls of slaw. I’ve kept the dressing in the fridge for up to two weeks. Start by processing all the dressing ingredients in a food processor or blender, until smooth. Adjust it to your tastes. My son, Chef Doug, likes it sweeter so he adds a little more brown sugar. 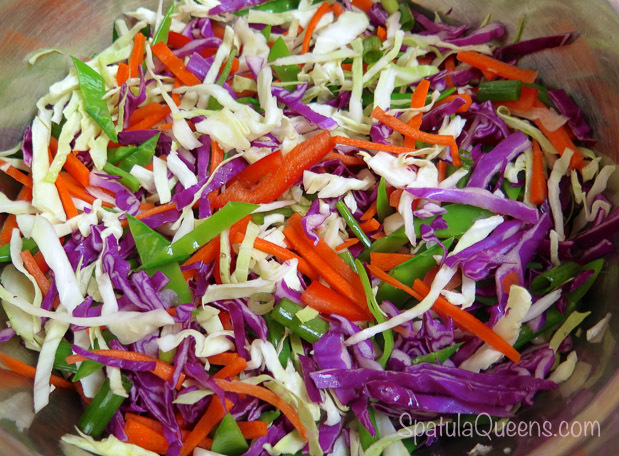 Prepare whatever vegetables you want in the slaw. We use green and purple cabbage, carrots, blanched snow peas, green onion and red bell pepper. Just before serving, toss about half the dressing with the vegetables and serve immediately. 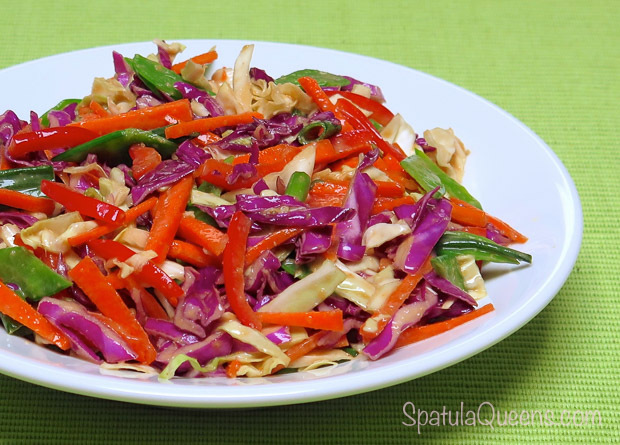 If you are taking the slaw to a party, take the dressing and vegetables separately and toss just before serving. Leftover slaw will be good the next day but will be a little watery, so it is always best eaten right away. When we’re in the mood for this slaw, we’ll sometimes cut up a large bowl of the vegetables, which undressed, will keep for 3 to 4 days in the fridge. 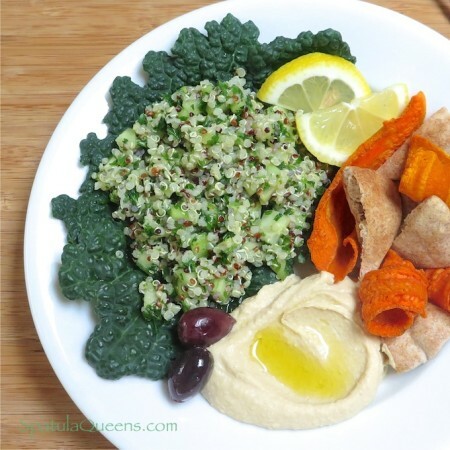 Everyday, we’ll portion out some of the veggies and toss with about 1/4 cup of the dressing – delish! 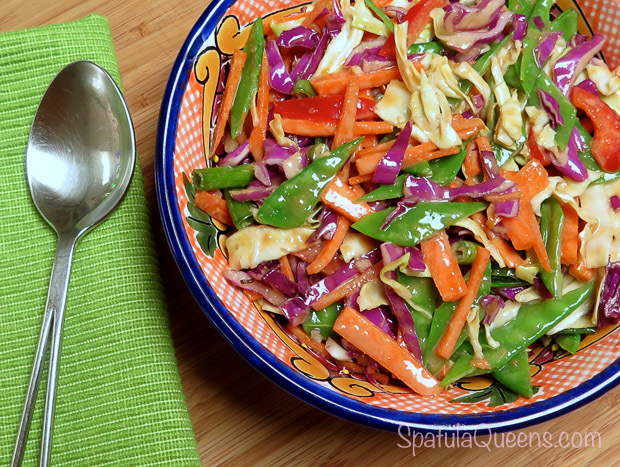 Sweet and Tangy Asian Slaw recipe from the Spatula Queens: A fresh, crunchy, loaded-with-flavor slaw. The dressing is very similar to a peanut sauce but the added vinegar thins it out and gives it a little zing. Process all of the dressing ingredients in a food processor or a blender, until smooth. 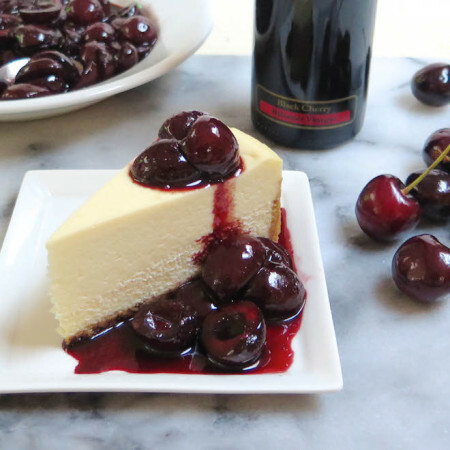 Set aside in a bowl or jar. 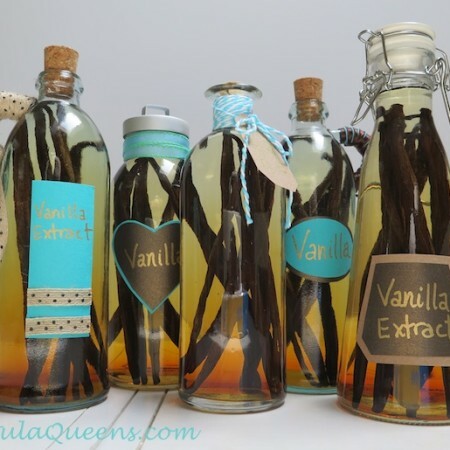 Dressing keeps in the refrigerator up to two weeks. 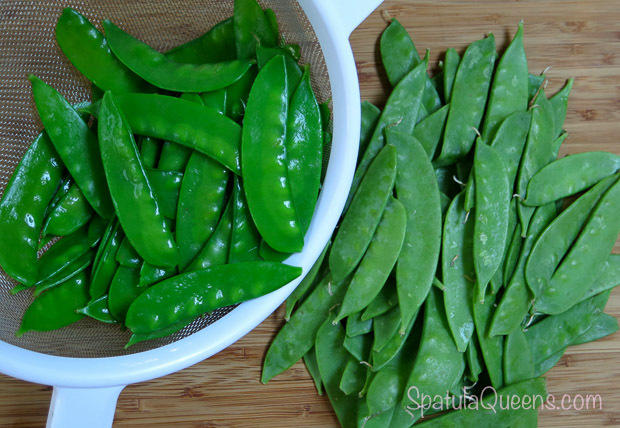 To blanch the snow pea pods, drop them into boiling water for no more than 20 to 30 seconds, drain and immediately plunge them into icy water to stop the cooking. The short cooking time brightens their color but maintains the crispness. Drain the peas and pat dry. 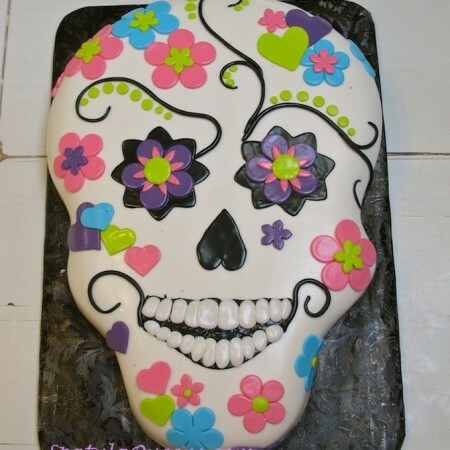 Slice them on the diagonal. Slice the remaining vegetables and add to the snow peas. Use a bowl large enough to easily toss the vegetables with the dressing. When ready to serve, toss about half the dressing (about one cup) with the vegetables and serve immediately.